HP's Spectre 13.3 delivers competitive performance and a respectable keyboard, in spite of its super-svelte body. 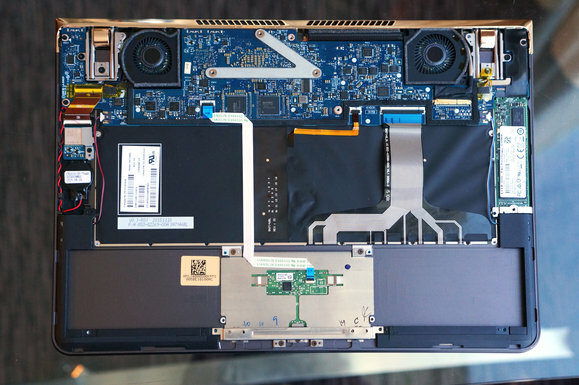 You might not think it's possible to build a super-thin laptop without compromise. But you would be wrong. Determining a laptop’s thinness can be tricky since laptops aren’t uniform blocks (well, except for that original Google Pixel). 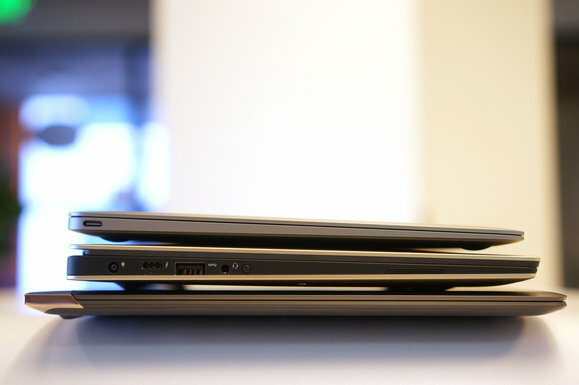 Most laptops are wedged, so at what point do you compare their relative thickness? The 2016 MacBook 12, for example, is 13mm thick at its rear, with the front lip getting down to 4mm. The Spectre 13.3 is, for the most part, 10.4mm to 10.5mm, with the back end measuring about 12mm. (And no, neither measurement takes into account the laptops’ rubber feet.) Given such variances, probably the best way to determine thinness is by eyeballing it. 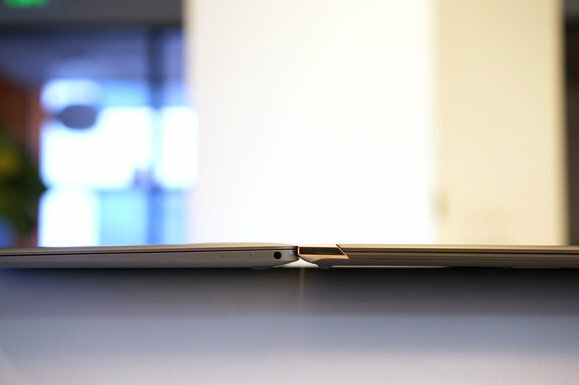 This picture of the Spectre 13.3 (right) next to a 2016 MacBook 12 gives you an idea how just how thin HP’s laptop is. The thing is, everyone knows Apple made a few compromises on the MacBook 12 to make it the “thinnest Mac ever.” You only get one USB-C port and at just 5Gbps. 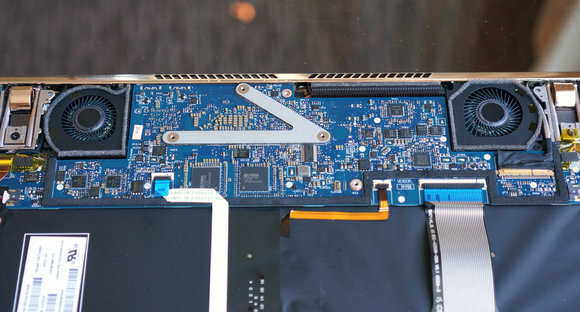 The laptop also uses a low-power Intel Core m chip. 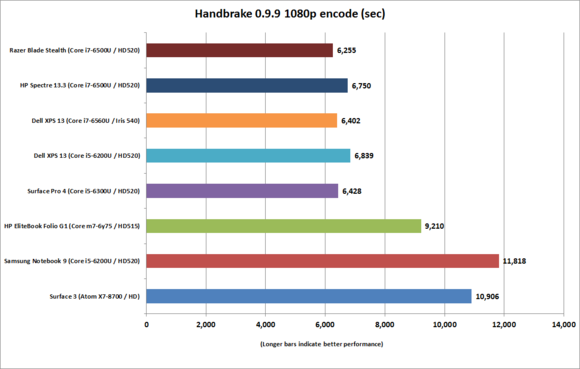 While I think the Core m often gets a bum rap, there’s no denying that it gives up performance against a Core i7-class chip, which the HP Spectre 13.3 offers. Another controversial feature of the MacBook 12 is its low-travel keyboard to save space. I’ve only met one person who said he actually prefers the MacBook 12 keyboard, and his opinion was delivered sheepishly—the same way you’d say you used the last bit of toilet paper and didn’t replace the roll. HP managed to get a keyboard with a full 1.3mm of travel into the Spectre while still keeping the body 10.4mm thick. The Spectre 13.3 is thin, but it’s also got quite a footprint, as you can see in comparison with the 2016 Dell XPS 13 and 2016 MacBook 12 stacked on top of it. Granted, the Spectre’s thinness negates the integration of USB Type A ports, but HP makes up for it. The Spectre has a single USB-C (5Gbps) and two Thunderbolt 3 ports. All three support charging as well, but only with HP chargers. So you get a full-travel keyboard and Core i5 or Core i7 power. There must be some compromise, right? Well, yeah. The screen. The display is a 13.3-inch IPS panel with 1920x1080 resolution. It has a Gorilla Glass 4 layer that’s directly bonded to the panel, which both protects and minimizes thickness. So far, no complaints. What’s more, in a darkened room with the backlighting at max, I didn’t see any excessive backlight bleeding. It could be a little brighter (it’s rated at 300 nits and I measured our unit at about 324), but it’s not dim. Overall, it’s quite nice. The problem is that people want higher-resolution screens or touch, and neither is an option on the Spectre 13.3. 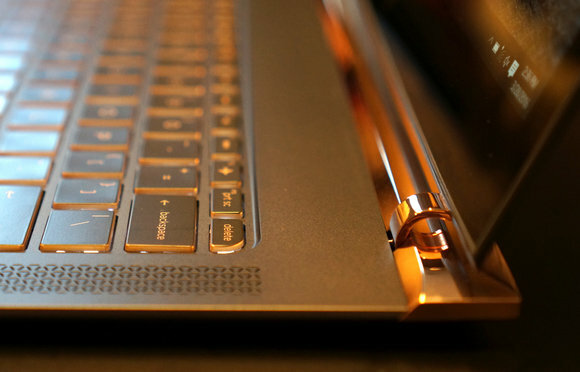 The HP Spectre 13.3 features cabinet-like hinges. One other limitation is in the screen’s tilt, which stops at about 120 degrees. For comparison, the XPS 13 tilts back to 140 degrees, while the 2016 MacBook 12 goes to just over 130 degrees. The 120-degree tilt works fine for me, but some people really like their screen to recline. The reason for the shorter tilt angle is HP’s unique hinge-and-piston system. The company says it used furniture-style hinges with tiny pistons to help keep the body thin yet still provide sufficient resistance when being opened or closed. HP is particularly proud of the Spectre 13.3’s keyboard, which as stated earlier, boasts a full 1.3mm of travel. It’s backlit as well. In use, it’s far and away more satisfying than the MacBook 12’s keyboard, and good overall—even if the keys feel a bit looser than those on HP’s Spectre x360. 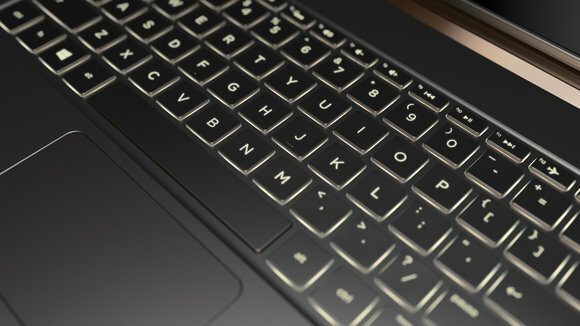 Here’s the standard keyboard in the HP Spectre 13.3. The trackpad is a tad small at 3.7 x 2.2 inches—quite a bit smaller than the trackpads on both the XPS 13 (4.2 x 2.4 inches) and MacBook 12 (4.5 x 2.75 inches)—but it still feels nice to use and features a smooth glass coating that your finger just glides over. The audio department is a little underwhelming. HP partnered with B&O for the Spectre 13.3’s speakers, but there’s really only so much one can do in a thin body. While the audio isn’t atrocious (Lenovo’s ultralight LaVie Z still holds that distinction), it’s not great either. It’s barely loud enough and lacks the presence that the much thicker Dell XPS 13 delivers. B&O does give you a utility to tweak the audio, but it can’t magically make small speakers sound larger. Here’s what HP’s new Spectre 13.3 looks like on a normal night out. I’ll admit it up front, I’m not a huge fan of the Spectre 13.3’s styling or color scheme. I’ve described it as gaudy—something Zsa Zsa Gabor might favor—but looks are subjective and therefore don’t have a bearing on the final verdict. The style did receive far more attention than most other laptops in the office, for what that's worth. 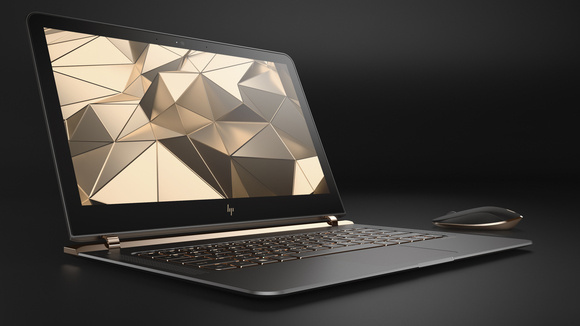 One feature HP brass likes to tout is how the Spectre’s “hyperbaric chamber” cooling makes the laptop thinner. Most laptops use a traditional heat pipe design: a copper plate with a wick material that helps move the heat to a larger piece of copper, which is then cooled directly by a fan. The image below shows this layout. The CPU’s cooler is on the right and you can see two heat pipes that transfer heat to the fan. The heat pipes on the left cool the GPU. Below is a close-up of the hyperbaric chamber, where you can see the foam insulation around the fans and the motherboard. 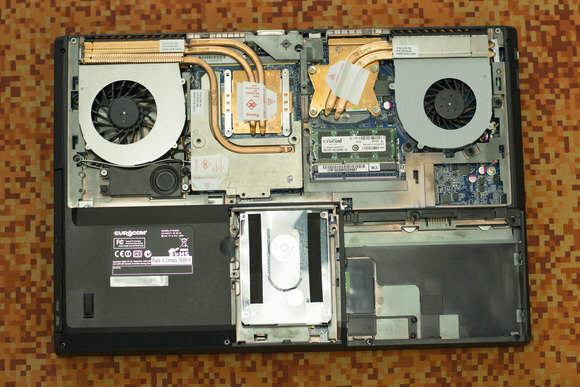 The bottom of the laptop would close against the seals to create the chamber. The CPU is actually mounted on the other side of the motherboard. 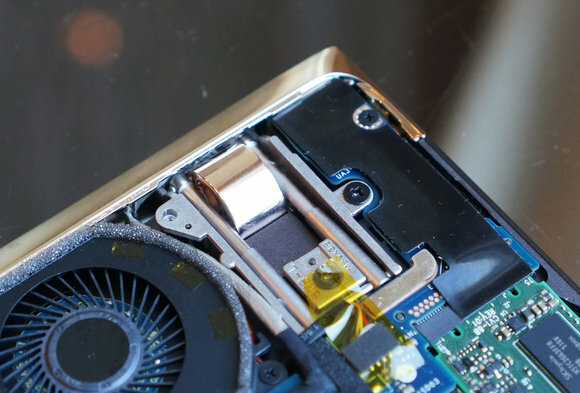 From this picture, we can see what looks like the fins from a heat pipe that is attached to the CPU, but again, the fans don’t directly interface with it. When HP said it used a hyperbaric chamber rather than a traditional heat pipe design, I was skeptical. After all, heat pipe designs have worked for a long time. Alternative cooling might be fine with a Core m, but HP offers up to a Core i7 chip. Could it keep that CPU cool enough to give you the performance you’re paying for? Or would CPU temps cause that Core i7 to throttle down to the performance of a Core m? With a Spectre 13.3 review unit in hand, I aimed to find out. For this review, I’m looking at the $2,000 version of the laptop. It includes a dual-core Skylake Core i7-6500U, 8GB of LPDDR3/1866 RAM, and a 256GB M.2 SSD. These specs are comparable to those of HP’s major competitors. Let’s dig into the benchmark results. Here’s that hyperbaric chamber in action about an hour into a video transcode, as seen through a thermal camera. 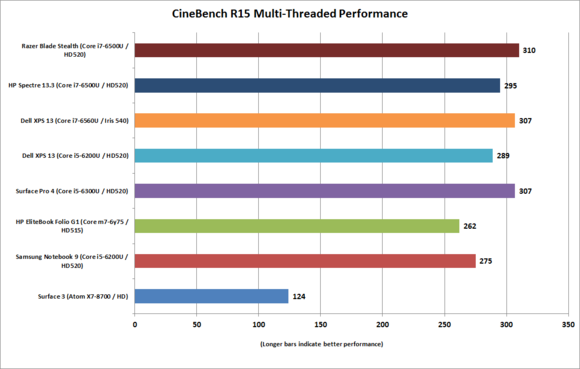 CineBench R15 is a benchmark based on Maxon’s Cine4D rendering engine. A pure CPU test, it hammers all cores and takes about five minutes to run on a dual-core laptop.The results aren’t bad, honestly. The Spectre 13.3 is a tiny bit off the pace of comparable Core i7 dual-core laptops, but surprisingly close when you consider that the other laptops are much thicker. The Spectre 13.3 hangs with the other Core i5 and Core i7 laptops. CineBench is a multithreaded test but it takes just a few minutes to run, so it’s hardly a challenge to the cooling in the Spectre 13.3. For that, we turn to our Handbrake encoding test, where we take a 30GB MKV 1080p file and convert it using the Android Tablet preset. On a dual-core laptop, it can take a couple of hours to run. We consider this more of a thermal soak test for this class of device, rather than a pure performance test. If the cooling isn’t up to snuff, you should see it here. Again, the Spectre isn’t at the front of the pack in finishing our encoding test, but it’s not too far behind. Frankly, I expected the Spectre 13.3’s cooling to fall apart on the long haul and slow to a crawl, but I have to say it’s very much a win when you consider the Spectre’s svelte body. Take, for example, the Spectre’s performance against the Samsung Notebook 9, which performs atrociously for a Core i5 chip. Again, the Spectre 13.3’s unique cooling holds its own in encoding chores. 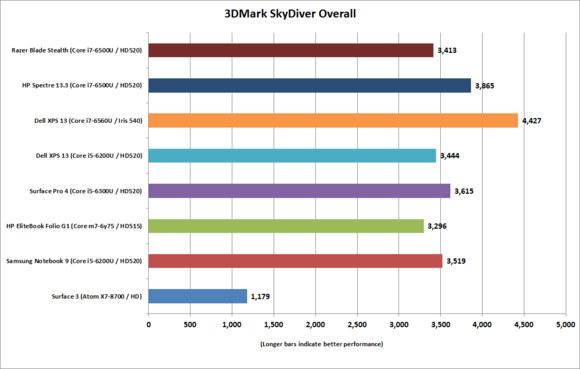 To gauge the 3D performance of the Spectre 13.3, we used 3DMark’s SkyDiver benchmark. It offers a workload appropriate for integrated graphics and the Spectre 13.3 does quite well here. 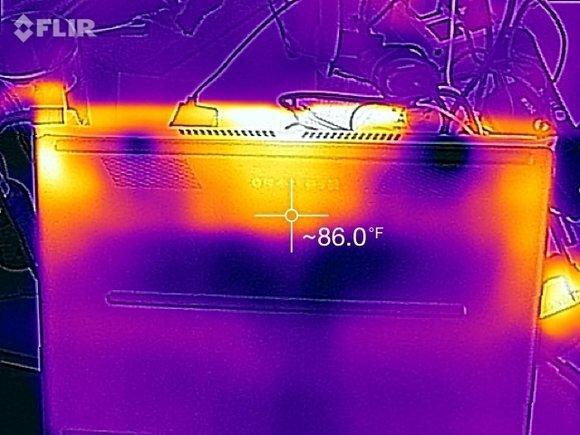 Graphics benchmarks are also a great way to test thermal issues. 3DMark allows you to run a demo mode before the actual test is performed. This means 10 minutes of graphics tests heating up the CPU before the benchmark runs. In laptops that are sensitive to heat, I’ve seen performance drop from 10 percent to 50 percent or more. On the Spectre 13.3, I initially saw about a 10 percent drop. But in the course of my testing, HP issued an updated BIOS to address another tester’s complaints about fan noise. With the latest BIOS in place, I saw no drop in performance, which indicates minimal to no thermal performance issues. I’ll also add that the fans do spool up when under a graphics or heavy CPU load, but it’s really not bad. Still, if you want pure silence, get a Core m laptop. Graphics performance is just where it should be with the Spectre 13.3. Performance and hyperbaric fanciness aside, the most important feature of any laptop is probably its battery life. 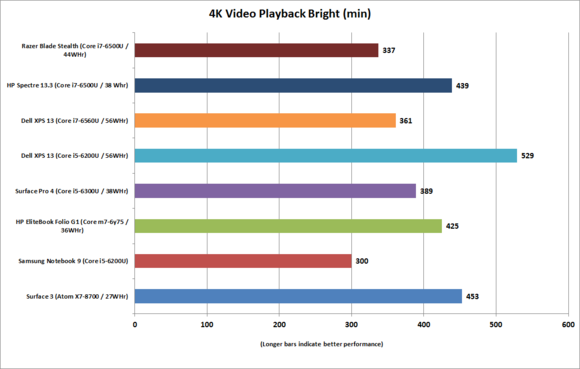 To gauge that, we play a 4K UHD video file using the Windows 10 Movies & TV player at a relatively bright 255 nits with analog ear buds until the laptop shuts down. The Spectre 13.3 doesn’t disappoint here. Only the Dell XPS 13 with a 1080p non-touch screen outlasts it, thanks to its giant battery. The Spectre 13.3 actually holds its own in video rundown performance against Core m laptops and even the Atom-based Surface. For that you can thank its 38-watt-hour lithium polymer battery, which is rated for 1,000 duty cycles. Well done, HP. In the end, I have to give HP credit for accomplishing its goal of making the thinnest laptop possible without compromises. You’re truly getting Core i7 performance in a body most manufacturers would outfit with a low-power Core m. And let’s not forget that the Spectre 13.3 gives you not one, but two Thunderbolt 3 ports and a USB-C port. Is the Spectre 13.3 perfect? No. The audio is average to below-average. I’m also bummed that the laptop won’t accept third-party USB-C chargers. I know HP’s reason, but it still doesn’t make me happy. In the end, the Spectre 13.3 is an impressive laptop. It gives you robust performance for its thickness, it gives you a keyboard you can actually work with, and its looks set it apart from all others.